The Library Media Center is dedicated to a former English teacher, Frances Hart Ewers, who loved reading and libraries. It is open to students during the regular school day, before school, after school and during lunch for their information, reading and technology needs. Students and staff are always welcome to use the Media Center resources and to seek assistance from the staff. The staff and services of the Frances Hart Ewers Library Media Center support student learning at East Lyme High School with numerous resources. We maintain a collection of over 30,000 books and 100 magazine titles. 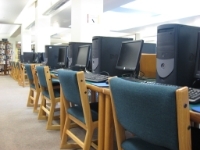 Our membership with Libraries Online (LION) provides us access to Overdrive, Zinio Online Magazines and books, CDs and DVDs from public libraries throughout the state. We also subscribe to a variety of online databases and ebook reference collections. Click on the LibGuides Resource link above to connect to any of these resources. Our conference and work rooms are available for teachers and their classes on a regular basis. Visitors to the Media Center have access to 180 computers, including three computer labs, and three classroom wireless laptop carts as well as two iPad Carts that are available for class projects..
East Lyme Public School District is a member of Discovery Education,and participates in their comprehensive, web-based library of digital resources and movies.